By now, if you don't know that I'm an R.L. Stine fan, than you just don't know me at all. I have managed to find and meet him at 3 Book Expos in a row! Also, click here to read my review of Red Rain (Stine's first adult novel). 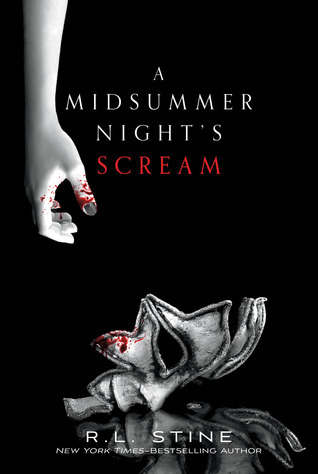 A Midsummer Night's Scream is classic Stine. It is a horror story mixed in with lots of humor and a touch of gore. The story takes place on the set of a re-make of a horror movie -- one, where 60 years earlier, everyone in the film died (cue the creepy music). As to be expected, once filming begins, people start to die one by one...again. I know the idea has been used before, but Stine changes it up by including tidbits from Shakespeare's A Midsummer Night's Dream. There are love triangles gone astray, the "Puck" character (who likes to mess everything up) and the age-old adage to "be careful what you wish for". I loved how seamlessly Shakespeare's play merged into this novel, and how believable it all seemed. Claire, our protagonist, was also a really fun to character to read. She was smart, funny, and never gave up on her dream to be an actress (even if it could've killed her). Her undying love for "the magic of it all" and her sense that anything is possible makes her an unforgettable leading lady. This book is definitely a 5 out of 5. It's also a short read (I finished it in one day's commute) so give it a chance and let me know what you think.